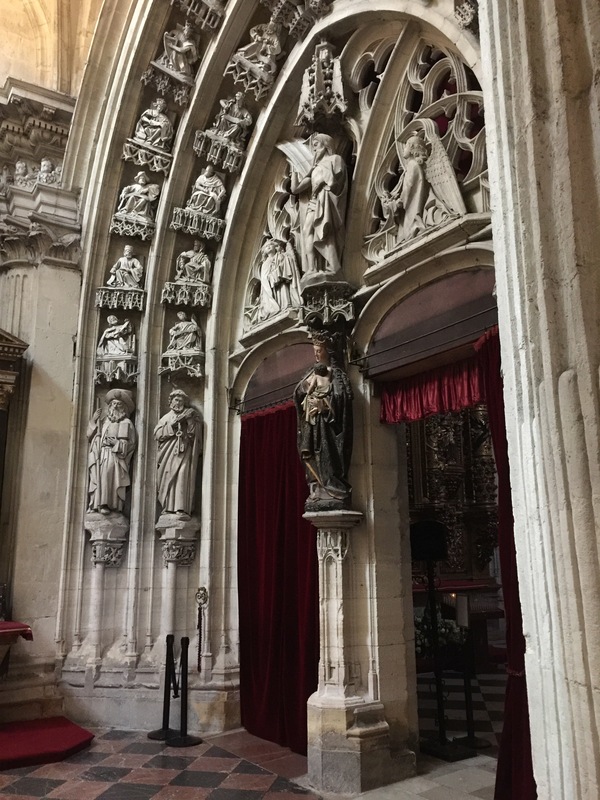 After I had walked from Burgos to León in 2016, I decided to add a few side trips to visit some friends and my daughter who lives in the U.K. 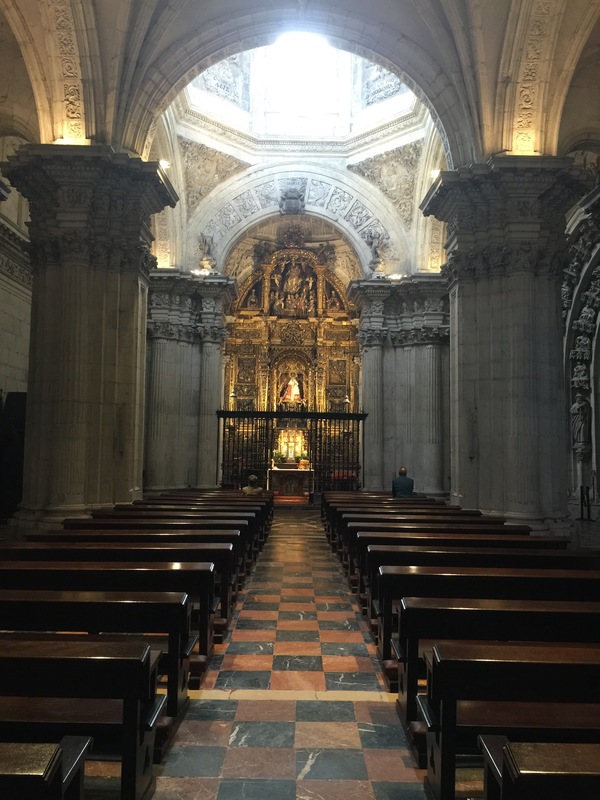 Seeing the Cathedral of San Salvador in Oviedo was important to me ever since I took a class in Muslim history at Columbia. 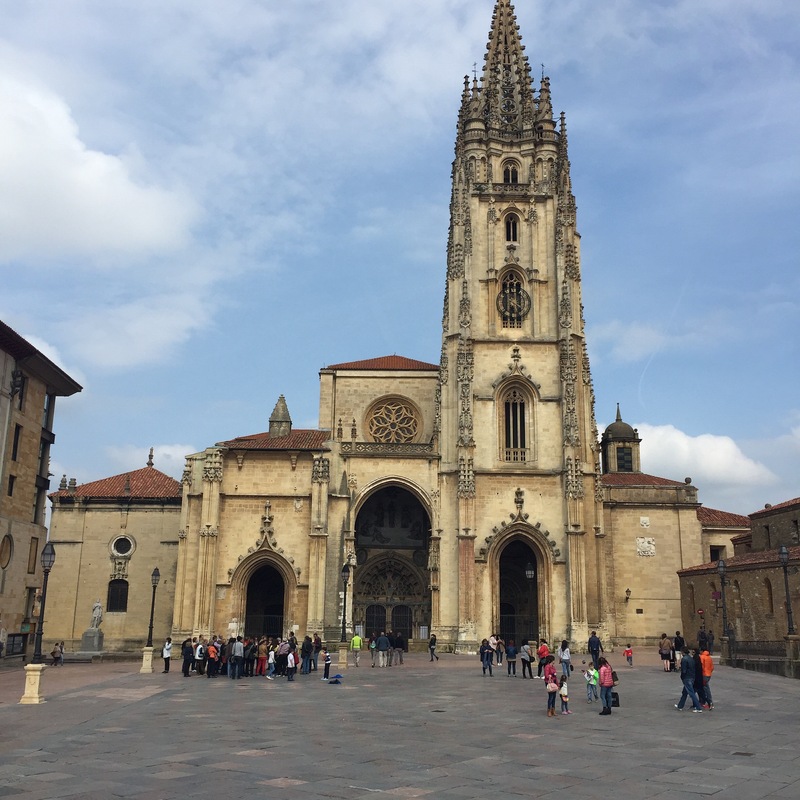 When I arrived in Oviedo, the hotel desk clerk told me, “Everything is closed, you know. It’s a holiday.” Never found out which saint was being honored or if it was just Pentecost Tuesday, but damn if she wasn’t right. 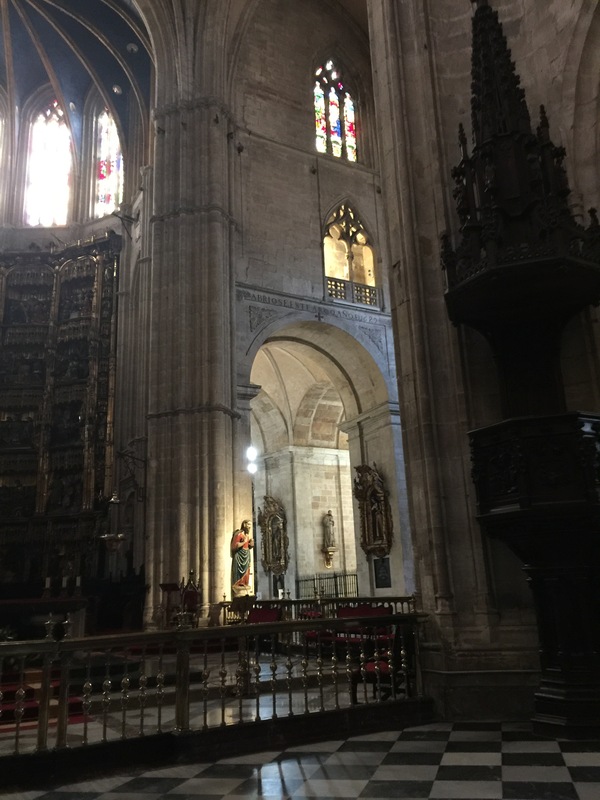 Including the very object of my visit: the stunning Cathedral of Oviedo. I was bummed. I’d planned initially to continue walking from here along the Camino Primitivo, but a combination of forces changed my plans. The weather was dicey and I was nervous there could be snow or dense fog. The route is challenging in the best weather. 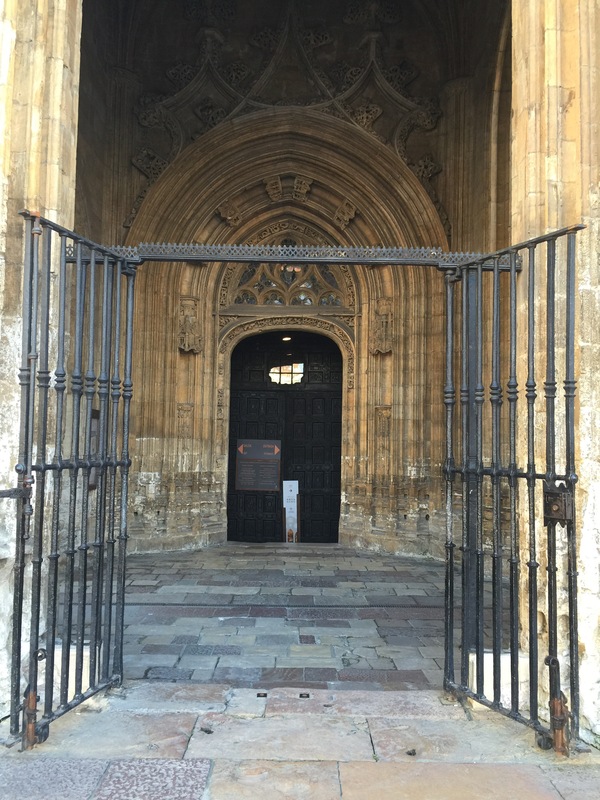 I was also worried I’d really gotten in over my head and maybe tacking a different new and unfamiliar route to my walk along the Meseta was just too much. 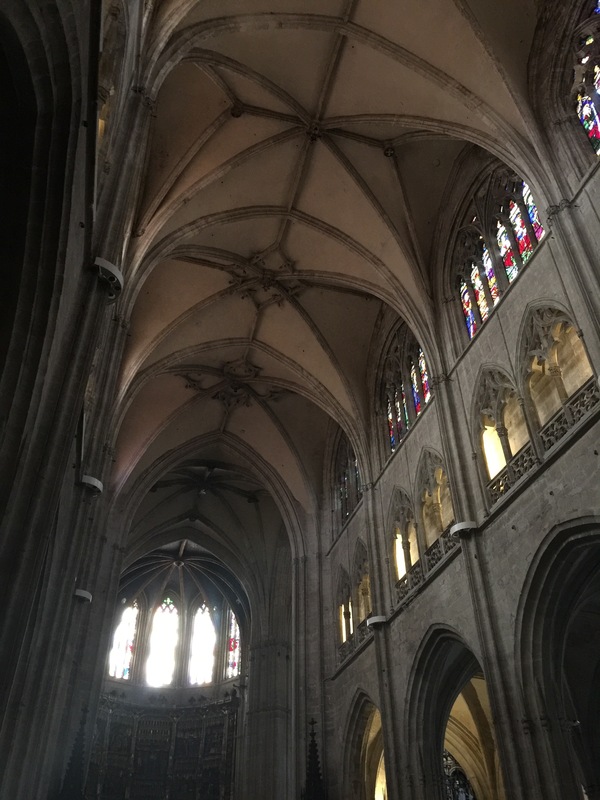 But I still wanted to visit this Cathedral. It’s been on my list for a long while and it’s what drew me to the Primitivo in the first place. So I took a bus from León just to spend the night and visit the church. And it was shut. But I kept thinking, maybe, if I’m there sitting in front of the place, somebody might need to get in and I’d slip in behind them. And that’s what happened the next morning! 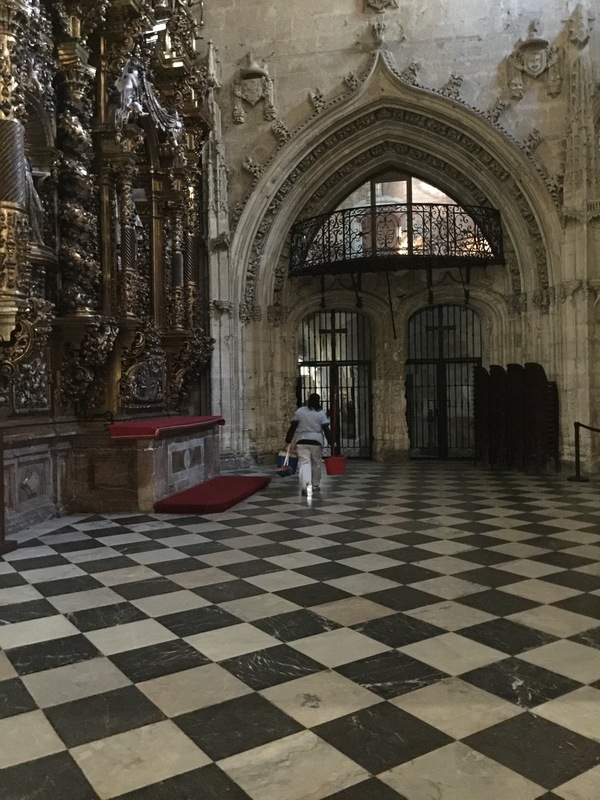 I’d remembered reading a note that said Mass was said every day in the Capilla de Santa Barbara at 9:15 a.m., so I waited – hopefully – on the plaza and this man, followed by a priest, opened the gate, unlocked the door, and the priest held the door open so I could step in. They walked ahead up the aisle and disappeared and I had the entire sacred space to myself. It’s now 8:55 a.m. and my bus is at 10:00 a.m. but I’m happy as a clam and not even thinking about the Mass. I walk into this beautiful side chapel. There are two people praying near the front and as I start to leave, that same priest that let me in takes the altar and begins to say Mass. I remembered my friend, Priscilla, saying Mass was only 20 minutes in León, so I take my seat. I have just about that much time before I’d have to get back to my hotel to get to the bus station. On my way out, I thanked St. James once again for guiding my feet. Next stop: Santiago de Compostela. I’ve been back to see this gem but will always cherish my first encounter. Posted in Camino Primitivo. Tagged caminodesantiago, littleoldladywalking.